Italian plum tomatoes find a special place in all the special cuisines, especially Italian ones. 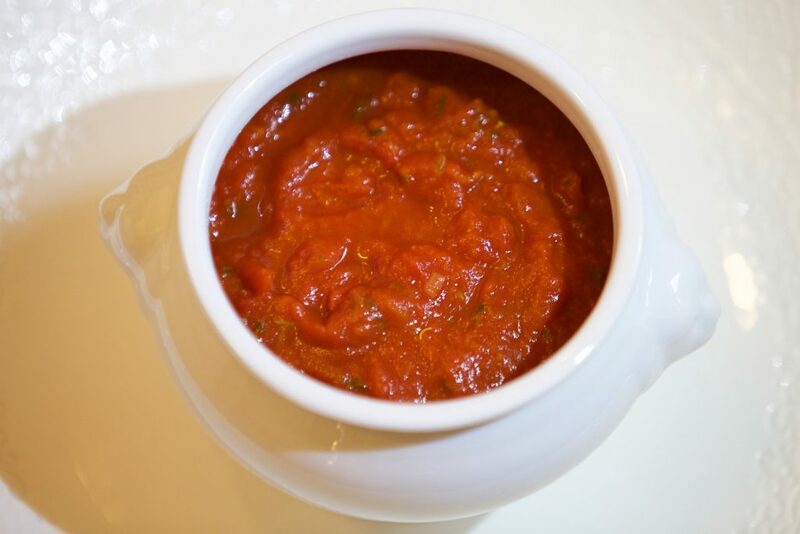 No sauce is complete without the good use of tomatoes; gravies don’t taste good until you add some tomato or its puree to add to its base. Tomatoes, whether freshly chopped or pureed, finds a special place in most of the recipes, be they are from any part of the world. From soups to salads, stews, gravies, lentils, sandwiches, sides, appetizers, there are several genres where you need to fit the tomatoes into the frame. Owing to such a diverse use of tomatoes, they are grown everywhere in different varieties. You can witness this variation in sizes, colors, and softness of the tomato. Plum tomatoes are one special kind of tomato which are grown on a wide scale for certain culinary uses. What is a Plum Tomato? Each variety of tomato is grown for a suitable purpose. Plum tomatoes are the ‘sauce tomatoes’ meaning that they are specifically grown for making tomatoes sauces or tomato paste which can be used in the recipes. You can identify a plum tomato from other tomatoes by look its shapes and the internal anatomy. From outside they are slightly cylindrical or oval in shape. On the inside, they have fewer locules, the seed compartments of a tomato, usually about 2 compartments. Their flesh to juice ratio is greater than ordinary tomato, which means the solid part is present in good amount. That is why they are excellent for pastes. Moreover, these tomatoes are every chef darling vegetable, as they allow easier handling and proves to be life-saving during the tomato offseason. These tomatoes are also known as ‘grape’ tomatoes, because of their small size. They are not only smaller in size but also appear more round in oval shape. They have a South East Asian origin and grows in the climate of that region. 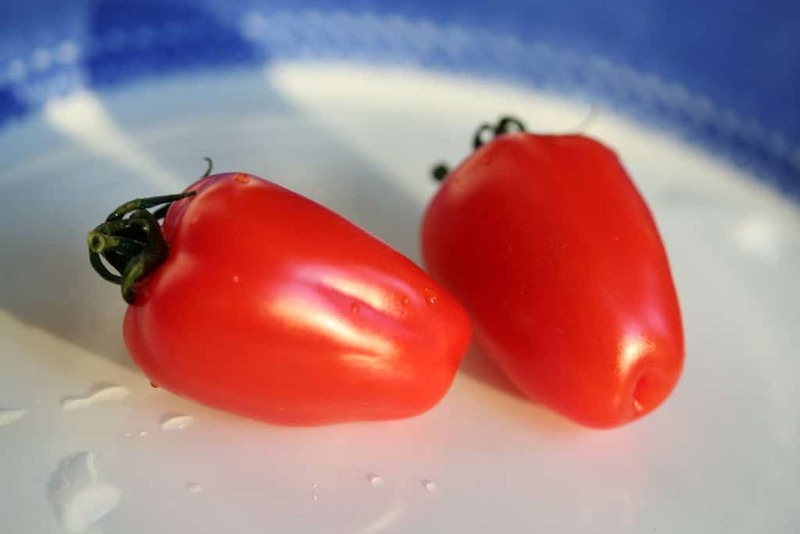 They are bright red in color and slightly oval, which makes them distinct from cherry tomatoes. Grape tomatoes are used for stir-fry recipes, sautéed vegetable mix, a certain type of salads, etc. Their taste is as sweet as the cherry tomatoes. Italian plum tomatoes are known as best for cooking. They can be added to sauce, pickles, jams, purees, soups, and gravies. These are a most grown variety of plum tomatoes and assumed to be the only type of plum tomato. They are larger in size and appears bright red in color with firm structure. 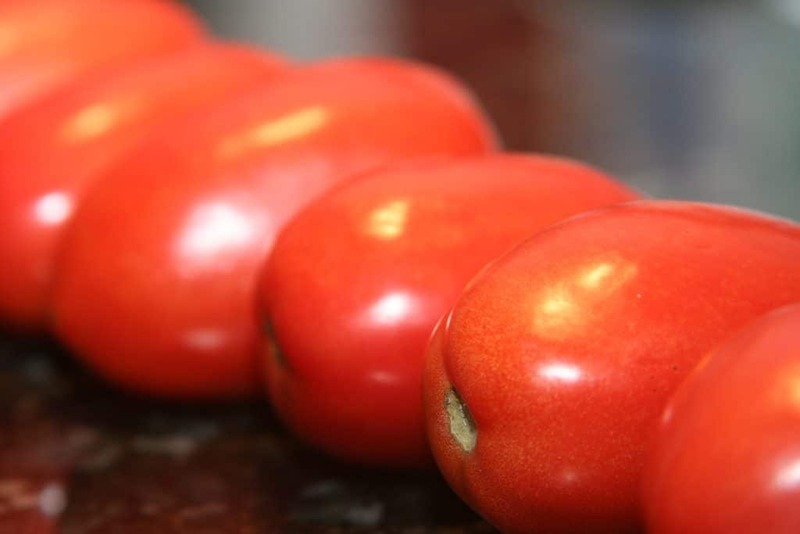 If you are cooking something meaty, Italian plum tomatoes are one you should be opting for. The sharp difference between the San Marzano plum tomatoes and other plum tomatoes is it pointed long shape of San Marzano. These tomatoes are somewhat more cylindrical in shape and end on an extended tip. 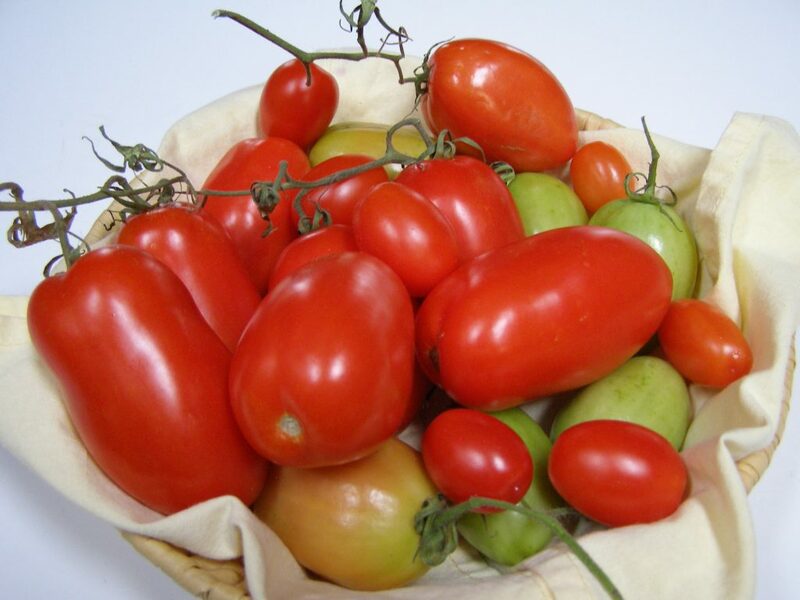 Their name came from the town of San Marzano, Italy, where they were first grown. They require a warmer climate for better growth. 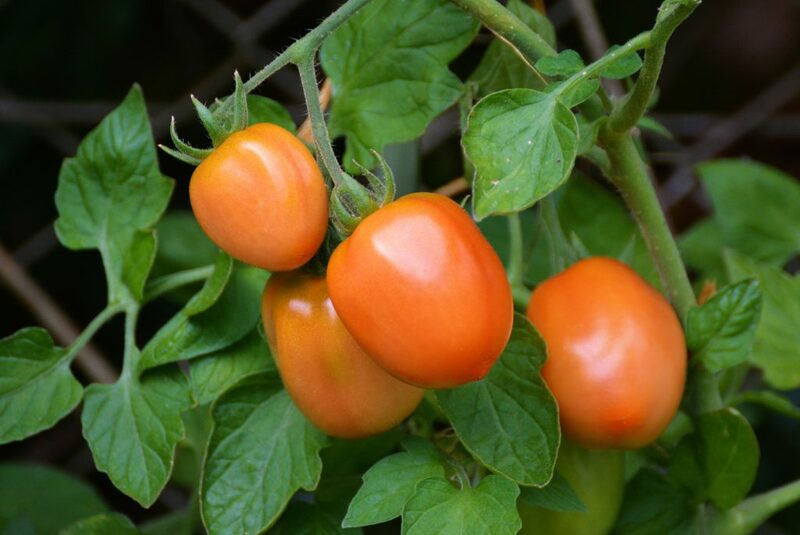 Roma VF is a special plum tomato variety, which is grown through an openly pollinated variety of plants rather than a hybrid. Most commercial produced and distributed plum tomatoes are Roma VF. They boil faster, and they are easily canned. The fruit turns out to be ripe and pear-shaped. Plum tomatoes are not that variety of vegetable which can only be found in fancy supermarkets. You can find it in a variety of its subtypes at every grocery store. Roma VF and Italian plum tomatoes are found at every nook and corner of the cities, but for grape tomatoes or San Marzano, you would need to look in your city as per the places. If you do not enjoy the taste of commercially grown tomatoes, you can always grow these at home, in your front yard or the kitchen garden. Trust me! Homegrown vegetables indeed have no parallel in flavor. How hard growing a plant at your home can be? Sow the seed, water it and wait! Right? When you go to the store to buy seeds for the plant, always look for a different variety of seeds, at least three or more. Each specie of plant behaves differently with the slight change of environment, and you will never know what grows a plant better. So, it is safe to sow variety, to get greater success. 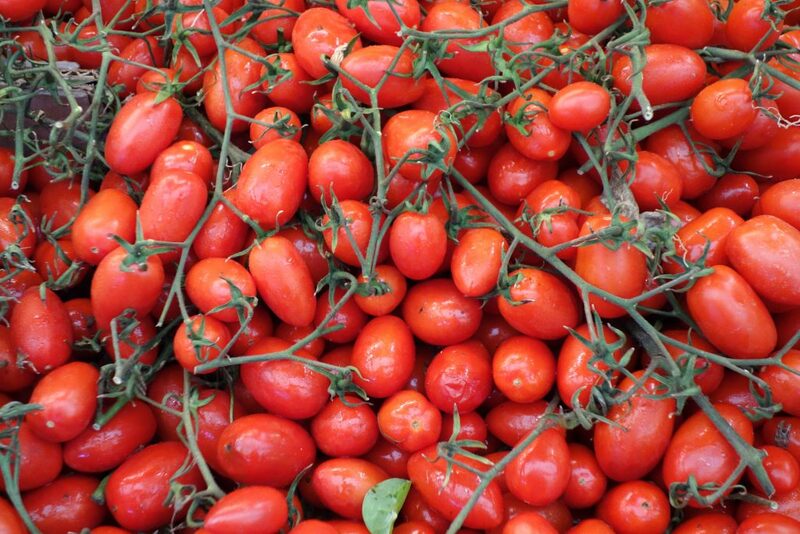 San Marzano is a good variety of plum tomatoes which can be easily grown at home. Tomato plants need good heat or warmer temperatures to grow. Keep the plant under a polytunnel or greenhouse for better growth. Keep the plant at a place with direct access to sunlight. Protect it from winds. The best time for sowing seeds is springtime or late winter. Start by sowing the seeds. Once the first 2 3 leaves appear, place them in a pot. And when the plant reaches to the height of 20 cm, you can plant them in the ground. Before planting them remember to add well-rotted manure or compost to the soil to make it more fertile. 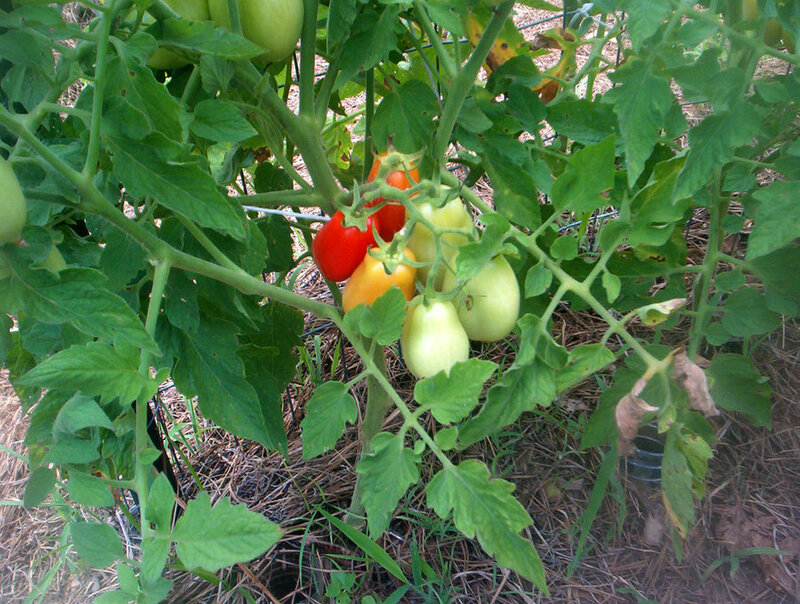 The techniques of companion planting work best for tomatoes. In that plants of other vegetables are grown alongside the tomato plant to act a sacrificial plant. Basil or garlic plants are best to use for this purpose. Once the plant reaches a certain height, it requires support to stand. Use wooden canes to support the branches. Do not water the plant, water the soil instead. Wet tomato stems and leaves are more susceptible to damage and slow growth. You would be amazed to know that there are hundreds of tomatoes variety that exists today. Some are edible, and even some of them are commercially produced and used on a large scale. Plum tomatoes, though have easier accessibility, still, if you don’t find them anywhere near for one reason or another, well here are some of the substitute you can look for. These tomatoes closely resemble plum tomatoes and may give the same results during cooking. The Amish Paste tomato has their origin in Pennsylvania, in the center of an Amish state, hence the name Amish Paste. The second part of their name suggests that they are great for making pastes or purees just as the red plum tomatoes. The look heart-shaped in appearance and had a bright orange-red color. They also have more solid content than the juices. 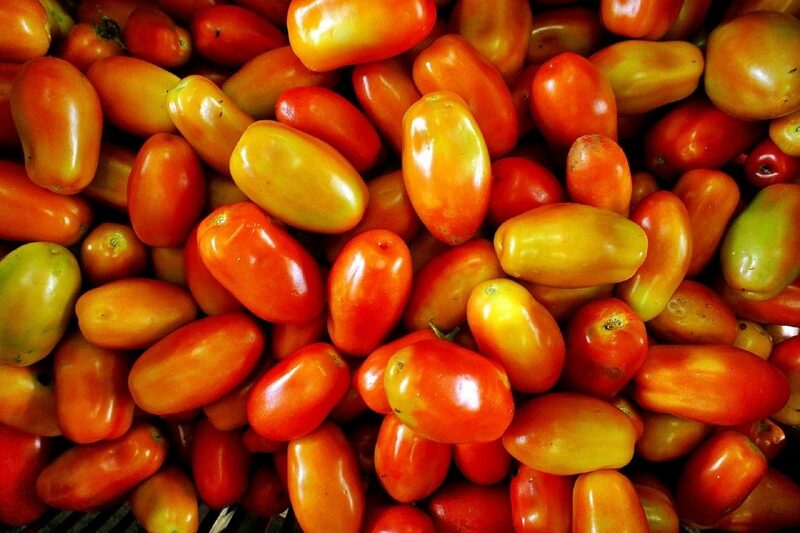 It is the hybrid variety of tomato which is available in classic red color in a smooth round form. They contain a lower amount of acids and carry a mild taste. When sliced they can be used in sandwiches, burgers or salads. This one is a Bulgarian variety of tomato which was brought the US in 1995. These are deep red, round in shape looking tomatoes. They are sweet and juicy in flavor. Their sweetness brings them closer to the taste of plum tomatoes. This variety of tomato is from Czechoslovakia which has rich red flesh and beefsteak shaped fruit. It is rich in flavor and contains a blend of sweet and acidic flavor. It is great for making bright red sauces. For this, you need 3 lbs. of tomatoes for 1 quart of the canning jar. Start by washing the tomatoes, discard any tomato with dark spots, cracks or soft spots. Now boil water in a large pot and add tomatoes for about 1 minute to the water. Strain the tomatoes and place them in a colander to cool down. Now peel off the loose skin and discard it. Also, remove the top portion and the core of the tomatoes. Lightly heat the jar by placing in a pot filled with hot water. Add tomatoes to this hot jar and pour 2 tablespoons of lemon juice on top. Lemon juice keeps the color of the tomatoes fresh and bright. 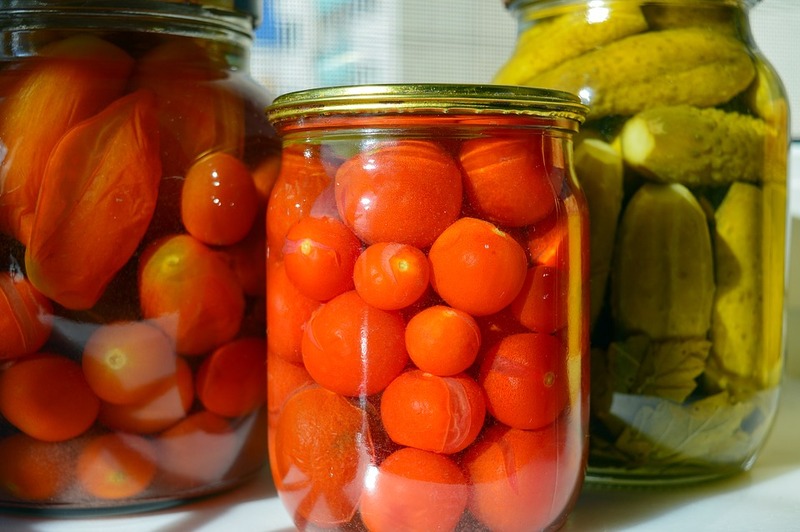 Gently press the tomatoes in the jar to create ½ inch space on top. Sprinkle 1 teaspoon salt on top. Remove any possible bubbles from the jar and cover the jar with the lid and seal it. Place the jar in the boiling water for 45 minutes. Remove the jar from the water and allow it to cool overnight. Keep the jar in cool and dark places to store. Use these canned tomatoes whenever needed. Freezing is comparatively a simpler technique which does not require long cooking time and saves a lot of your precious time. There will be no peeling of the skin and or overnight cooling. Take the ripe firm plum tomatoes which are free from cracks and blemishes. Chop the tomatoes after removing the top and core of the tomatoes. Add chopped tomatoes to the simmering water for 15 minutes until soft. Drain the tomatoes then puree them in a food processor. Add the puree to a Ziplock bag and seal the bag after removing all the air. Spread the puree in a thin layer. Freeze them in the freezer for 1 hour or until further use. When it comes to tomatoes, there are many health benefits which are associated with them. Tomato is rich in nutrients and contains lots of essential vitamins. According to the reports released by the USDA National Nutrient Database, tomato contains a good amount of vitamin K, vitamin A, and vitamin C along with thiamine, folate and vitamin B6. A number of basic minerals are also present in tomatoes including copper, manganese, potassium, magnesium and phosphorous. The flesh and skin of tomatoes is a good source of fibers and protein. Tomato contains a sufficient amount of lycopene in its flesh. Lycopene is an antioxidant which kills the cancer-causing agents or other harmful radicals released in the body. Even when you cook or process the tomatoes, the amount of lycopene is retained and defends the body from cancer. Recent research by Harvard School of Public health student revealed that tomatoes are effective in fighting prostate, cervical, breast, esophageal and stomach cancer. Lycopene has another great quality. It stops the lipid oxidation in the body which prevents the accumulation of the fat in the vessel. This can save us from several cardiovascular diseases. According to the British Journal of Nutrition, a daily intake of tomatoes can reduce the amount of bad cholesterol from the blood. Tomatoes contain a handsome amount of vitamin A. These vitamins are essential to maintaining the form and function of the retina present in our eyes. Thus, tomatoes can improve our eyesight and prevents night blindness. Vitamin A is also an antioxidant which can detoxify the body from free radicals. With its loads of fibers, juices, and minerals, tomato can also aid digestion and actively prevents diarrhea or constipation. It maintains the internal environment of the gut; therefore, it is good for peristaltic motion and bowel movements. We know that our kidneys work in the critical balance of sodium and potassium balance maintained inside. People having hypertension has disturbed levels of potassium or sodium in the kidneys which mess with the fluid retention in the body. Potassium is the known vasodilator, which decreases the tension in the blood arteries or veins. And tomatoes contain a sufficient amount of potassium which makes them effective to reduced hypertension. Since tomatoes fight against oxidation in the body, it can reduce the stress which causes the type 2 diabetes. According to a study published in the Journal of the American Medical Association revealed that the daily intake of tomatoes could reduce the chances of type 2 diabetes. Tomatoes contain protein, so they are great for skin, and hair health. When the tomato juice is applied on a sunburn, it can cure it. If consumed daily, tomatoes also protect our skin from UV light-induced erythema problems. They are also anti-aging in their properties. And the list does not end here, tomatoes are also an antiperspirant, meaning that they treat excessive sweating. Start by scoring the tomatoes gently with a sharp knife. 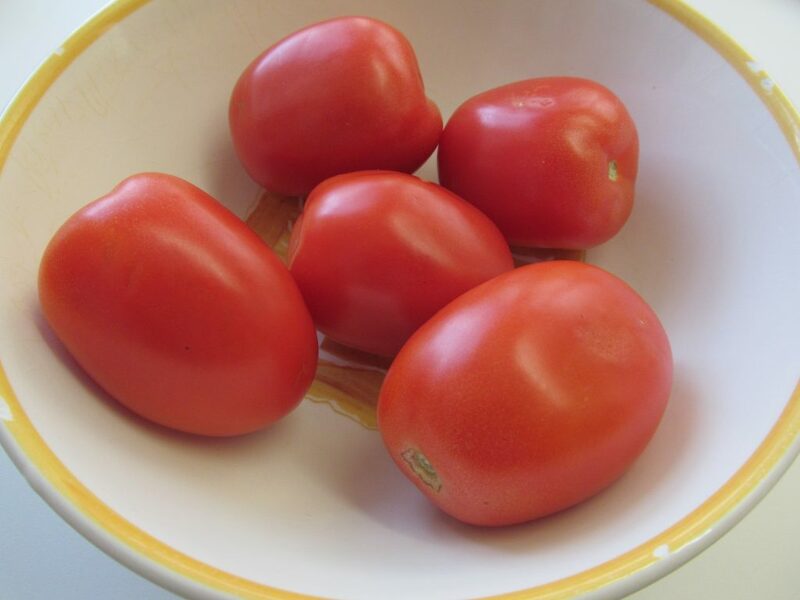 Add these peeled tomatoes to boiling water in a pot for 1 minute. Strain the tomatoes and transfer them to the cold water bath. First, peel the tomatoes then dice them into cubes. Sauté garlic with red pepper in heated olive oil in a skillet for 1 minute. Stir in chopped onion and cook for 2 minutes then add plum tomatoes. Now cook for 5 minutes and add salt and parsley. Tomatoes are indeed a miracle fruits with so many varieties available, filled with a great many benefits. Plum tomatoes are even so special as their solid content is far greater than any other type with a lower proportion of seeds and juices. These tomatoes are best for all type of sauces, whether you are trying an Italian cuisine or a French one. Read through the details of each variety of the tomato before hitting the grocery store, as you may get confused between the good and the best. Your selection should always depend on the use. Do not go for raw firm fruits to make sauces or purees as it would not result in the desired color and consistency. Stick to the basics, and you will do great!